Julia Polk returned to campus for Reunion Weekend and shared her story as a doctor in global health and advice for those interested in a similar direction. Dr. Julia Polk knows a thing or two about the path less taken. After graduating from Northwestern University in 2007 with an anthropology major, global health minor and international experiences in Mexico and South Africa, Polk, whose name was Harris as an undergraduate student, went to Brazil for a year to conduct global health research at the National School of Public Health in Rio de Janeiro. Right afterwards, she moved to Beer Sheva, Israel, for a medical degree at Ben Gurion University, followed by an obstetrics and gynecology residency at Drexel University in Philadelphia. Now, she works as an OB/GYN and clinical instructor at Mount Sinai in New York City. But Polk’s international experiences didn’t end with medical school; she still completes weeks-long trips in rural medical facilities in Liberia two to three times a year. Just this past June, she went to train nurses and midwives in the field. In October, Polk shared her advice with the Northwestern community, especially targeted to the 55 percent of students in Global Health Studies who pursue a pre-medical track. She talked about when to take gap years—after undergrad and after residency, but not between medical school and residency—to only conduct research if you actually care about it and can talk about it, and to even postpone pre-med classes and take a post-baccalaureate program if organic chemistry is “bringing your average down,” she said. But the piece of advice advice Polk emphasized above all else is to be grateful. Polk is still very connected to Northwestern. She helps current undergraduates at Northwestern navigate their experiences through the Global Health Mentorship program, which pairs undergraduate mentees with alumni mentors to chat about career development opportunities. “I really admire how Dr. Polk has found a great balance with her work in the U.S. and abroad,” says Becca Sinard, a Weinberg senior and one of Polk’s mentees. “When I first met her, I was like, ‘You are who I want to be!’” she laughs. Polk has helped Sinard through the interview process for medical school. In January this year, Sinard was preparing to interview for the Undergraduate Premedical Scholars Program (NUPSP), which allows early MD admissions to the Feinberg School of Medicine for dedicated and high-achieving Northwestern undergraduate students. With Polk’s help, Sinard was accepted into the program and is set for medical school next year. “It was great answering some of the interview questions with her, bouncing ideas off her and getting tips before the interview,” says Sinard. Polk has been involved in the mentorship program since the program took off in 2013, and credits the program with providing important structure to facilitate building mutually beneficial relationships between mentors and mentees. As for benefits for students, Polk says it’s helpful to have a mentor who has just vacated the shoes that the mentee is standing in, so that mentees can hear about how new trends are affecting the careers they’re interested in and have meaningful advice about how to proceed, in school and after school. Overall, she emphasizes being grateful and appreciating the four years that undergraduates have to explore. Throughout her own undergraduate career, she did exactly that—explored the world through Northwestern’s opportunities. Polk tried to learn as much as she could by seeing as much of the world as possible. In South Africa, she learned that by living in a country and seeing things with her own eyes, she could understand the underlying issues affecting health—like how the lack of educational infrastructure contributes to the spread of HIV. In Mexico, where she didn’t speak Spanish, she learned how uncomfortable the language gap was, how to navigate it and how to empathize with diverse peoples in the U.S. who don’t speak English. But Polk didn’t always want to be a medical doctor; in her undergraduate career, she studied anthropology instead. 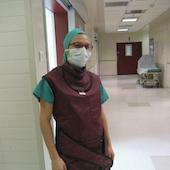 She only found her calling as a medical doctor after graduation, during her time in Brazil. At the time, Polk was working with vulnerable, disenfranchised women, and she wanted so badly to advocate for them and be a voice. The logistical issues with research boards and the slow-moving nature of her work frustrated her. After sitting in on clinical interactions where she could see, explicitly, how OB/GYNs empower and personally touch the lives of the women they serve, she decided to join their ranks and work towards an MD. Even now, however, in her day-to-day life of teaching, performing C-sections and delivering babies in private and public clinics in New York City and Liberia, she counts all of it—her anthropology and global health background, and the languages she picked up around the world—as vital to her interactions with a diverse array of patients and students. Polk notes that knowing a few phrases in multiple languages can make a patient’s day, and recognizes the bravery a pregnant woman exhibits when she visits an American clinic without knowing the language. This article was originally published by Northwestern’s Office of International Relations.